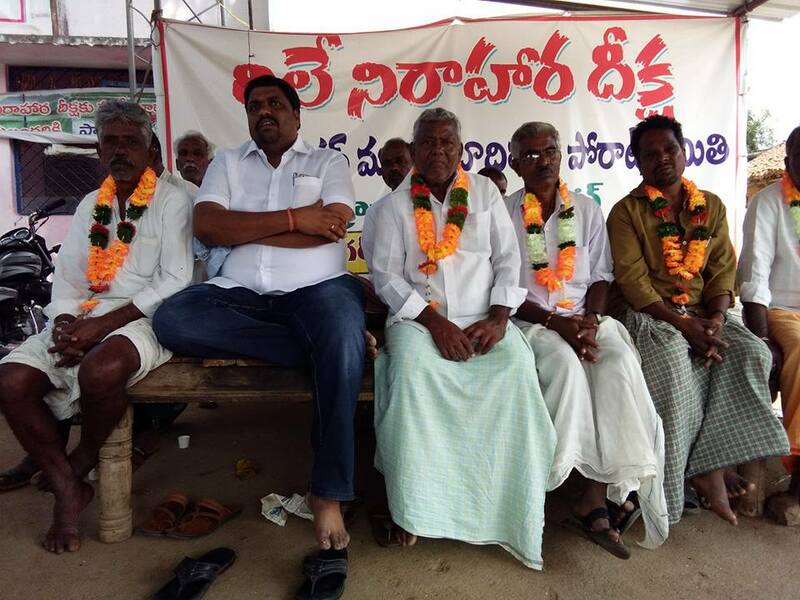 "We will fast for as long as we have to,” say protesting farmers who face displacement, even as the Kaleshwaram irrigation project has already received environmental clearance. Ranga Reddy woke up at 5 am on December 1o, 2017, bathed in cold water and dressed in a white veshti and shirt. He had a busy day ahead. 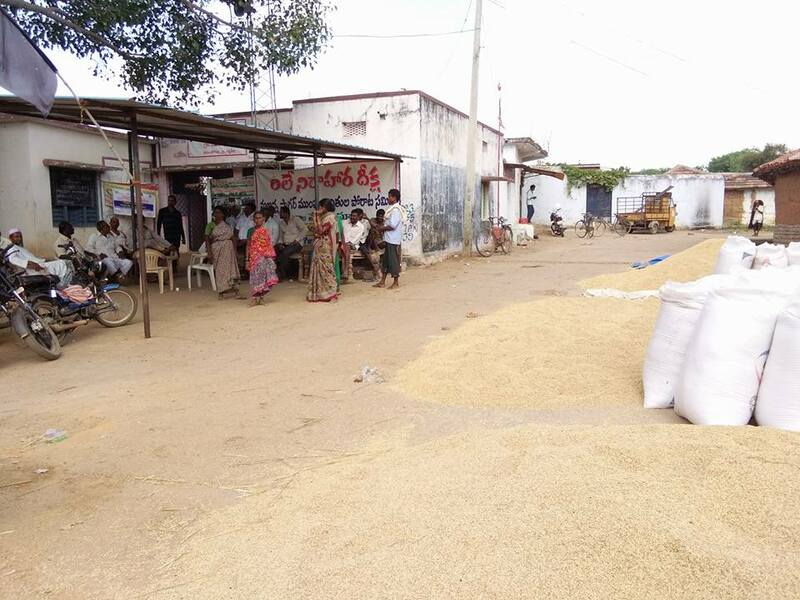 Reddy walked towards a make-shift shelter in front of the panchayat building of his village, Vemulaghat in Siddipet district of Telangana. The shelter has no walls, just a fan hanging from the roofing sheet. At precisely 10 am, he sat under the sheeted roof, on an elevated platform. Five others joined him. The women of the village sang a traditional song, garlanded the men and left to work in the fields. A man gave them water from a steel jug, which was to be their last for 24 hours. These men fast till the next group of five or six comes along the following day. The villagers are resisting giving up their land for a 50 TMC (thousand million cubic feet) reservoir under the Kaleshwaram irrigation project, that would submerge their villages. The Rs 80,500 crore project is being jointly implemented by Maharashtra and Telangana. The Lift Irrigation Scheme will lift Godavari river’s water from the Medigadda barrage near Kaleshwaram temple town and is expected to provide irrigation farmlands in Karimnagar, Warangal, Nizamabad and Medak districts. In 2015, the government of Telangana announced a reservoir in Mallanna Sagar, the largest among reservoirs in the Kaleshwaram project. In order to build the Mallana Sagar reservoir, the government wants lands from eight villages, including Vemulaghat. On June 4, 2016, a group of villagers began the hunger fast, by sitting down under a large tent in the same spot. It has been more than 600 days, and the villagers continue their relay fast, with a fresh group relieving the hungry men every day. A few months since they first fasted, a temporary shelter was built by collecting funds from the villagers and a few days after that they installed a fan. “We can even build a permanent structure if our demands are not met,” said Reddy, adding that “We will fast for as long as we have to”. Vemulaghat has become a symbol for many discontented villages across the state. Incidentally, many people fasting against the state government today are the ones who fought for a separate Telangana. One of the main points of struggle for Telangana, before the bifurcation, was the fight for water. “In fact, the benefits of major irrigation have gone to coastal Andhra. The total area under canal irrigation in the entire Telangana region is much less than the area irrigated under canals in Guntur district alone,” said M. Kodandaram, chairman of the all-party Telangana Political Joint Action Committee (TJAC), a group which was at the forefront of the Telangana struggle. “That was one of the reasons we demanded a separate state,” he said. Today, the K. Chandrashekhar Rao government is keen on irrigating lands across Telangana. In February 2017, the chief minister of Telangana vowed to achieve the goal of irrigating one crore acres of land in the state, while inaugurating a lift irrigation scheme in Khammam district. “But at what cost?” asked Kodandaram. The question many villagers across central Telangana are asking is who is benefitting from the state of Telangana? Who are these irrigation projects for, if the state is displacing farmers in large numbers? “Our own people are displaced without much thought given to their rehabilitation or sustainable development,” said Kodandaram, adding that he can’t see much of a difference between the present Telangana government and the previous Andhra Pradesh government. Displacement without rehabilitation is not the only grievance of the people in Siddipet. They do not believe that the Kaleshwaram irrigation programme will see the light of day in its current form. Telangana gets rainfall for three months on an average. The government wants to store water for these three months and use it the rest of the year. During the rainy season, the government believes it can fill reservoirs such as Mallana Sagar by lifting two TMC water every day from the Godavari. “That sounds so ambitious that one can argue it is almost impossible,” said Dr K. Babu Rao, retired scientist, Indian Institute of Chemical Technology. First, rainfall is not uniform on all 90 days that it rains. Second, Telangana has water-sharing agreements with neighbouring states of Maharashtra and Andhra Pradesh, who will raise concerns if Telangana lifted from the Godavari water indiscriminately. 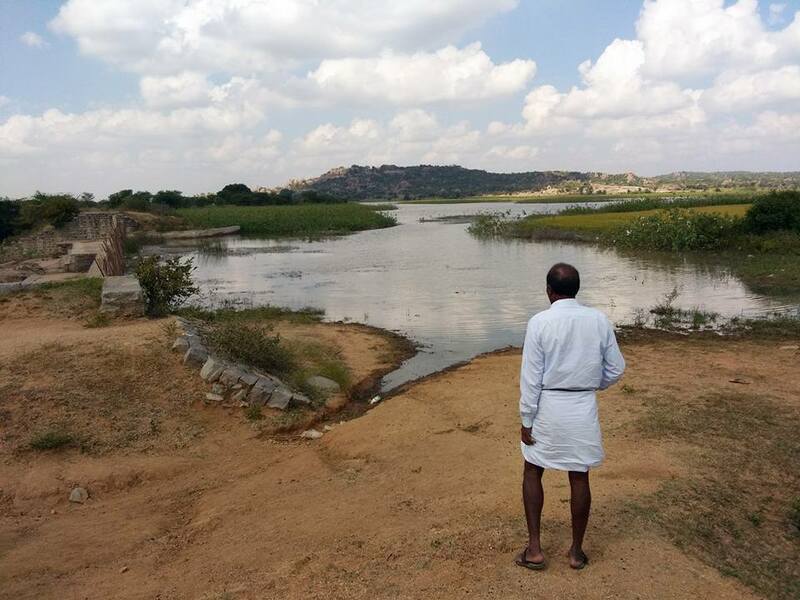 And third, lift irrigation costs completely obliterate the corresponding benefits, according to Mohammed Hayatuddin, 48, a land-owner in Vemulaghat who filed a case in the National Green Tribunal and got a stay on the Kaleshwaram project in October 2017. Providing irrigation does not always mean lifting water from the rivers or diverting a river, explained Dr Rao. It is about understanding the nature of water availability in a particular region and using irrigation technology that suits the farmers there, he added. “Irrigation in Telangana is effectively done through large lakes and groundwater recharge,” he said. These are cheaper methods to ensure that agricultural fields are irrigated well. “This makes us wonder if the Mallanna Sagar reservoir is a giant land scam,” said Hayatuddin. If there isn’t enough water to fill such large reservoirs, why are large swathes of lands being acquired? The men fasting in Vemulaghat smell corruption. Of the eight villages that would be submerged by the project, only Vemulaghat has been resisting. The other villages have given up their lands, according to C.H. Ravi Kumar, an advocate in the Hyderabad high court who is fighting the cases for farmers of Vemulaghat. “Fighting the state to save your lands is not an easy task, especially for unorganised farmers,” said Kumar. Vemulaghat has financially-stable farmers who have large tracts of land. This has ensured that the movement to resist acquisition has held so far. “Earlier, all eight villages were resisting. Now, they have all sold their lands to the government,” said Reddy, who has 23 acres of fertile land on which he grows rice, cotton and corn. “The state government coerced some of them and lured others away with money,” he added. The ruling Telangana Rashtriya Samiti is very careful to ensure that land acquisition – to realise its dream of irrigating 1,00,000 acres – happens without overt violence. Both the Telugu Desam Party, which rules Andhra Pradesh after the bifurcation and the Telangana Rashtriya Samiti, which is in power in Telangana, want to differentiate themselves from the Congress party which ruled Andhra Pradesh from 2004 to 2014, until its division in June 2014. The Y.S. Rajasekhara Reddy-led Congress government was infamous for forcible land acquisition especially to set up special economic zones (SEZs) across the state. One of the most violent examples of this was police firing which killed seven people in Mudigonda village of Khammam district in August 2007. The villagers were protesting land acquisition. The very next month, in September 2007, a huge force of hundreds of armed policemen guarded the villages of Srirampuram, Rayavaripodu, Mummidivaripodu, Ramaraghavapuram and Katurivaripalem, and beat up men and women while the land survey officials finished their jobs of surveying notified land for the Kakinada SEZ. In order to mark a departure from such forceful acquisition, the ruling TRS passed a government order in 2015 which encouraged ‘voluntary’ sale of land. Under the order, if a farmer wanted to give up his land voluntarily, he need not have invoked the Land Acquisition, Rehabilitation and Resettlement (LARR) Act of 2013. The LARR Act lays down rules for social impact assessment, environment clearance and consent of the inhabitants of such lands. Activists challenge “voluntary” sale of land. “Sure, land is not snatched under the armed watch of the police, like during YSR’s rule, but land is being coerced out of the rural landowners either by spreading misinformation about land use or cheating,” said Kumar. Landowners are either misinformed that they have to face dire consequences if they didn’t give up their lands or unlettered people are made to sign land ownership papers, explained Kumar. Such tactics work in Telangana as the land holdings in the state are smaller than in states like Punjab and Maharashtra. According to a report released by the finance minister of the state, Etela Rajender, in January 2017, the average land holding in Telangana in 2010-11 was 1.12 hectares (2.8 acres) against the all-India average of 1.16 hectares. This ensures that most farmers do not find their lands to be as productive as those with larger holdings. “It becomes easier to make the farmers give up their lands ‘voluntarily’,” said Usha Seethalakshmi, an activist. In January 2017, the Hyderabad high court squashed the Government Order No. 123, claiming that those dependent on these lands were denied benefits under the new Land Acquisition Act of 2013. But the ruling brought respite for less than six months. In May 2017, the Telangana government notified The Right to Fair Compensation and Transparency in Land Acquisition, Rehabilitation and Resettlement (Telangana Amendment) Act, which severely dilutes the consent and social impact assessment clauses. Unless farmers, such as those in Vemulaghat protest, there will be no push for land reform in the state ever, said E.A.S. Sarma, former Union secretary of power and a prominent civil society voice. “Therefore, Vemulaghat-type struggles are important,” he added. Protestors might not be able to hold the fort for long. The Environmental Clearance for the Kaleshwaram project came in December 2017. This is a final nail in the coffin for the protesters at Vemulaghat. But their spirits do not seem dampened. “We braved the lathi charge of the government in July 2016. We are not afraid of anything,” said Venkat Lakshmi, a panchayat member. Raksha Kumar is a National Foundation for India Media Awardee, reporting on land rights.